I was travelling through Ghana with a bunch of students for the last several days and have not had reliable internet access (or energy to do much but fall into bed in the evenings). I am back on the water today though with an interesting passage from Proverbs. The general topic of infidelity and lust for someone other than someone within the context of a marriage covenant is the topic in this passage. The consequences of partaking of this “stolen water” are not pretty. “Stolen water is sweet”. It tastes good at the time, but hidden within this “sweet” water are the seeds of all sorts of trouble that we would be better off avoiding. I am reminded of the fact that in Ghana it is typically not wise to drink or brush your teeth with anything but treated water. The consequences of taking untreated water, even water that may taste very “sweet” can be days in the bathroom or worse. Why would the way in which we obtain something change the nature of it? Why would obtaining something in a way contrary to God’s plan for our lives taste sweeter than water obtained within the plan God has provided? I think the answer is linked to the complex “ecosystem” of mind, body, and spirit that our soul inhabits here on earth. The term “water” here is being used metaphorically, and I think more broadly, to refer to any action taken at a time, with a person, or within a context that is contrary to God’s plan for your life. This of course assumes that you are able to discern God’s plan for your life. You have to be connected to the spring to be aware of God’s plan. We can avoid “stealing water” by becoming a good listener so we can hear God’s whisper, and by developing spiritual “whiskers” to keep us from placing ourselves in places or situations likely to lead to “water theft”. This passage reminds me of a scene from the Magician’s Nephew from the Chronicles of Narnia by C.S. Lewis. The two main characters Digory and Polly have found their way into Narnia through a “wood between the worlds”. They arrive in Narnia as Aslan (the Christ figure) is singing Narnia into existence. Unfortunatley evil Queen Jadis entered Narnia by hitching a “ride” with Polly through the wood between the worlds. Digory is asked by Aslan to go obtain an apple from a certain tree to help protect Narnia from the evil of the queen. The queen enters Narnia at the wrong time and place and will bring great evil (she becomes the white witch who shows up in the Lion the Witch, and the Wardrobe). 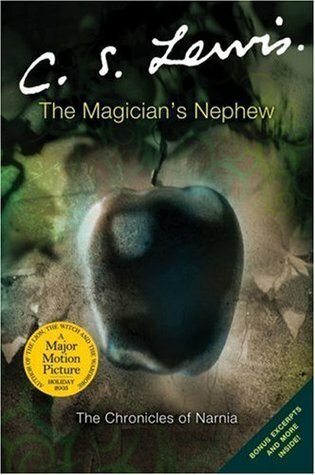 The queen follows Digory and steals an apple from the tree and she tries to convince Digory to do the same to heal his dying mother back in our world. Digory chooses wisely to listen to Aslan and follow His plan rather than the queen’s and returns to Aslan with the Apple. Aslan honors Digory’s faithful following by granting him an apple to heal his dying mother. The Apple Aslan provides is fruit from the apple tree which grew from the apple retrieved in the way Aslan requested. It was obtained at the right time in the right way. So we are given a choice…we can hang out “deep in the realm of the dead” making our own choices about how we treat our bodies and the bodies of others or we can stick with the plan God has for us…our call. Prayer: God you know the plans you have for us and part of that plan is only taking “water” that is meant for us. Help us to faithfully follow You and discern the proper time to take “water”. This entry was posted in Covenant, Death and Dying, Discernment, Divorce, Following God, Free Will, God's Love for Us, Life Together, Marriage, Obedience, Proverbs, reconciliation, Sin and tagged bible, bible study, C.S. Lewis, Christianity, Chronicles of Narnia, Daily devotional, faith, water. Bookmark the permalink.